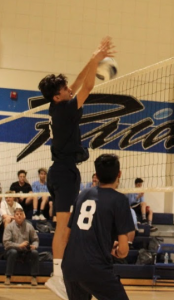 All three levels of boys volleyball defeated Savanna yesterday in league play. The Varsity won in straight sets and improved their league record to 2-1. Eli Arambulo had 12 kills on the day and a string of 6 tough jump serves in the 3rd set to seal the deal. Jose Sanchez had 11 kills and 5 digs. Danny Ibarra had 6 kills, 4 digs and 2 blocks. Brian Juarez had 7 kills and a string of four serves in the first set to put the game out of reach for the Rebels. Overall the defense came up with 26 digs to shut down the Rebel offense.